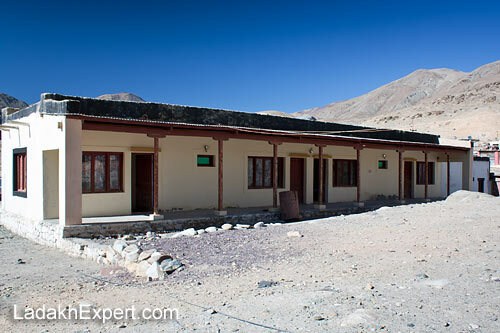 During my winter trip to Ladakh in 2012, I stayed at the Hot Spring Resort in Chumathang, which is a small town en route to Tso Moriri. While the so called resort doesn’t looks like much and even its restaurant was closed during the winter. 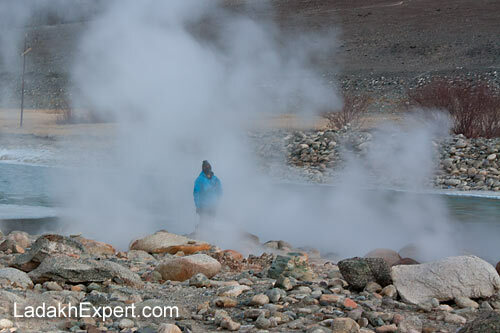 Thanks to its proximity to the hot springs, it remained relatively warm during the night, even though the outside temperature was easily -15 degree Celsius at night and there was no heater in the room. Room was also quite cozy and did have electricity in the evening, along with an attached Western Style Toilet, though understandably there was no water in the taps during winter. There were a total of four rooms available at the hot spring resort and we paid Rs. 500 per room at that time. The reason we stayed at Chumathang was due to the fact that little if any accommodation was available at Korzok in December and Chumathang is much warmer and is located at a much lower altitude than Tso Moriri. Chumathang also has mobile phone connectivity (BSNL only). Of course the fact that one could witness warm water of hot springs merging in to the partially frozen Indus River and enjoy an outdoor steam bath was just a big bonus for me and my travel partners. Overall, we really enjoyed our stay at Hot Spring Resort in Chumathang and even though we would have loved it if their restaurant was operational as well, it wasn’t a major turnoff, since we could get decent food at Chumathang Village. I am owner of the hot spring resort chumathang. It has been glad to see the picture view of the chumathang .Wonderful and fascinating; u have any chance to visit the leh/chumathang again. Now the hot spring resort has change. my e-mail ID is [email protected]. try to contact me to see the beautiful area of the chumathang. It has great pleasure to write.